Chabichou is a soft, fresh tasting goat cheese from Poitou-Charentes. The texture is smooth yet quite close-textured. Produced traditionally with a lovely aromatic rind, it can be eaten young and fresh, however it reaches its ideal state – sweeter and crumblier – as it matures and dries out. 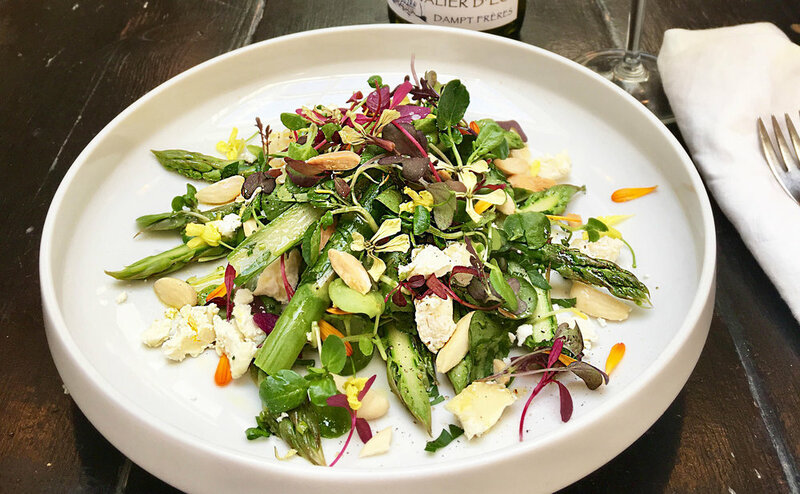 It works incredibly well with this light, fresh salad, and pairs excellently with a glass of Domaine Dampt ‘Tonnerre’ Chevalier D’Eon. Bring to boil a pan of salted water. Snap the asparagus and blanch in water for 3 to 4 minutes and when done put them in a bowl with ice water to stop the cooking. In another bowl pour the red wine vinegar, olive oil, Dijon mustard and mix well and then add the chopped herbs. Drain the asparagus well and toss in the dressing, add the watercress and the breakfast radish. Sprinkle the goat cheese and the almond.